Welcome to our 27th episode in our newer podcast series where we cover everything related to investing in tax-delinquent real estate. In other words, we focus on properties where the owners have not paid the property taxes. As a husband and wife investing team, we’ve done nearly 3,500 deals – in land and houses – with little competition and big profits. And we want to share what we know with you. In today’s episode, we’re talking about the use of options in real estate, which allows us to think outside the box and use our creativity in deals. This happens to be a favorite strategy of Michelle’s – with good reason. Intro: Are you ready to transform your financial future? Here is your chance to see inside the mindset of self made millionaires Jack and Michelle Bosch, as they pull back the curtain on secrets that can make you rich. Discover how everyday people are breaking the norms and building empires from the ground up, using little known yet proven, and time testing wealth building real estate strategies. It’s my pleasure to welcome you to the Forevercash.com podcast, and introduce you to our hosts, Serial entrepreneurs, investors, educators, and bestselling authors, Jack and Michelle Bosch. Strap yourself in for the ride of your life. Jack: All right, hello everyone this is Jack Bosch. 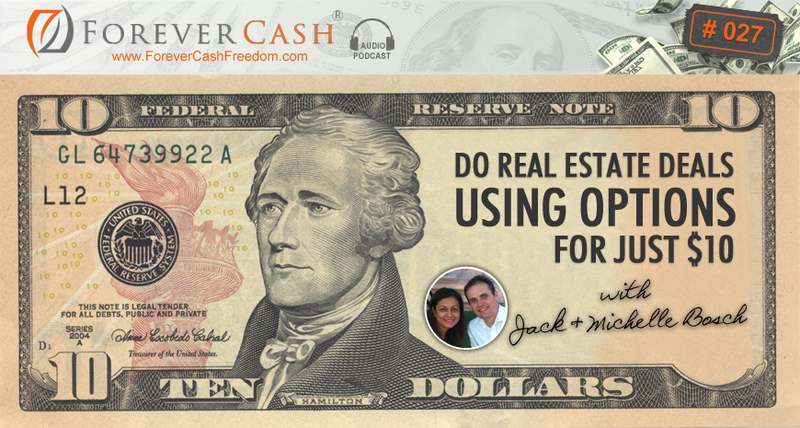 Jack: Husband and wife team here at the Forever Cash Real Estate Investing podcast. I’m excited to share with you another podcast, how about you Michelle? Michelle: I’m excited too especially because it’s one of my favorite subjects, it requires some creativity, some outside the box thinking, and yeah it’s one of my favorite. Jack: Wonderful so my voice is a little chopped today, I don’t know what happened; we might have gone out yesterday. And I have been in the room with a lot of people where it was very loud, so — but Michelle voice sounds fresh as always. Jack: So therefore let’s get started, so what we are going to talk about today is about the use of…? Jack: Of options in real estate, but before just quickly as always, I want to let you know that our meeting notes, actually podcast notes are available at forevercash.com/podcast. As well as if you are new here we are talking mainly about real estate — within the real estate area, we are talking about the concept of land flipping, house flipping and all under the umbrella of tax delinquent real estate investing. Basically when you find properties that the owners have not paid the property taxes, the good news is the counties have lists of those people. They are often — most of their properties are free and clear, most of their properties — they don’t want their properties anymore, because they already stopped paying property taxes in many cases. They have indicated that they don’t want them anymore. And these are some of the most motivated sellers and some of the bests deals in entire real estate that you can get. Michelle: And maybe a little bit too much wine. Jack: That is a possibility although I’m feeling fresh as a flower this morning. So, just quickly as we are talking about options. But still if you are new brand new, we have a mini course for you that shows — that guides you through all of our five different techniques that we like to use, and you can find that at forevercash.com/freedom, okay or forevercashfreedom.com, you can go either one of those. Again all the transcripts and all those things you find at forevercash.com/podcast. So let’s get started now. Michelle: Okay, so yes, so today’s topic is options, and many of you have probably heard about options in the context of stocks. And they are considered derivatives in the financial markets. And basically all that means, that fancy terminology, all that it means is that an option is basically — so you have an asset and in the financial market it’s the stock. And then you have an option which is a contract and that contract basically is something that gives you the right, but not the obligation to buy the stock at a certain price. Jack: Or sell the stock. Michelle: Or sell the stock at a certain price absolutely depending whether it’s a caller option. Here in real estate — so the real estate, the property is the underlying asset, and the option is basically a contract again where you can buy the property at a certain price for a specific amount of time. It’s not like you are locking in the property, but you have a specific period of time depending on whether it’s exclusive or non exclusive the option. You have the right to purchase that property at that agreed upon price. Jack: However, that’s — and you already said it, but not the obligation. Jack: That’s one of the key distinctions, because in our seminars people always asks us well Jack why don’t you use — why do you use an option over a contract, or when do you use a contract and when do you use an option? So define those terms, a contract is if when you go to the seller and say hey, Mr. Seller I’m offering you $100,000 or whatever the number is, let’s say since we are doing our land deals often and only in hundreds and thousands of dollars. So I’m offering you $3,000 for this property, I’m going to close in 45 days, close of escrow is 45 days from now, and we are going to use X, Y, Z type of company. That’s a contract where both parties sign and both parties are locked in to that. Now there’s ways to get out, my contracts or our contracts always has a provision that you can back out anytime for any reason, but at the same time that’s a contract, that’s a purchase agreement contract. The other contract Michelle talked about was the option contract. So for now I’m just going to use sale agreement and contract to distinguish the two. So both are contracts, but sale agreement then option that we are going to use. So the first thing I just said was the sale agreement. The option as Michelle said is an agreement where you basically say hey Mr. Seller, please give me the right to buy this property in the next 60, 90, 120, 180, however long you want do it, but I won’t have the obligation to buy it. That means that if that time period let’s say you make it for four months 120 days, if that 120 days pass, nothing happens, the contract just goes puff! I mean the option just goes puff! Jack: It expires and nobody has any rights, and nobody can sue the other person for specific performance or anything like that. It’s just basically – it’s a one sided right where the seller gives you the right to buy that property. But you do not have the obligation to buy it, so therefore because it’s a one sided contract, there’s often a monetary transaction that happens to make that happen. Happens to make that happen — you all know what I mean. Michelle: Basically when you ask of someone to give you the option basically to buy that property, you have to pay a nominal amount yeah? Or what it’s called an option consideration, yeah? Jack: Right, now if this is an exclusive option and the seller knows what they are doing, that option consideration can be more than nominal. It sometimes it’s in there, let’s say those people out there that buy land for big builders. They go out to the farmers and they lock down these pieces of land with five year options. Now the farmers know what they are doing and they know what’s happening, because they are not the first guy that knocks on the door. So in some cases if they lock down the option to buy the farm land for $10 million, they have to give the farmer an option consideration of sometimes 5% of the purchase value. In this case they have to pay $500,000, in option consideration to lock down that farm land for the next five years, so that the builder then has five years’ time to basically prepare, and draw all other plans, and then buy it and then build 150 houses or 500 houses on it. And that’s well worth it for the builder to do that. In our world however we are not dealing with those kinds of numbers. Michelle: Yeah, so perhaps it would be good if we explain the difference between an exclusive and non exclusive, because that’s what really makes the difference in making that option consideration really high or nominal. Jack: Great point, do you want to do it, should I do it? Michelle: Nobody can market the property even if they were to find a buyer, they would still not be able to sell it to them, they are basically locked in with you. Jack: The seller cannot sell that property to anyone else in the time frame of that option. So if that’s a five year option, then the seller cannot sell that property to anyone else over the course of these five years. If they do they are in violation of a contract and the option holder can actually sue them, and basically sue them for what’s called specific performance, or for damages, or whatever it is. I’m not a lawyer, nor an attorney nor do I play one on television, so I don’t know the exact details of that. But in a non-exclusive option, that actually doesn’t play a role because in a non exclusive option the seller gives the person that comes with the option the non exclusive right to buy the property. Which really means that the seller can sell the property to anyone else in that time period of that option, so again if that’s a five year option, and the day after they sign that option somebody else walks up to the door of that seller and says, hey I want to buy your property, he can sell that property. So therefore he is truly not locked in. So now if you do the farmer’s example again right now, where the builders — a builder guy comes and he wants an exclusive option, he might have to pay him $500,000. If he wants a non exclusive option he might have to pay him only 100 bucks. Michelle: And for example we can use back in the day when we were just starting, we actually were going to — we went to a tax deed auction in California Sonoma County. And we were on our way there excited thinking we are going to be able to purchase a property worth the $3,000 budget that we had. And reality check it was like — it was such a competitive environment. Jack: Assess her parcel number? Michelle: Yeah, and so — and we were able to find a little bit of information on value and we decided to go ahead — that I was going to go ahead and give her a call the next morning, and offer her basically an option. Because we figured that the property was going to be worth anywhere between $120,000, $150,000, and we figured if we asked her if she is willing to sign an option contract for 75K, or 70 that would give us enough margin to turn around and wholesale that property very quickly. So I called her the next day and that’s exactly what I offered. I offered to her a non-exclusive option and it being a non-exclusive, all I had to pay for it was $100 and she accepted. Jack: Right. Now why didn’t we just go and buy this property if it was such a good deal? Michelle: Because we didn’t have the seventy grand. Jack: Exactly right. We were starting out. We were starting out. We went to the auction with exactly with actually $3500, that’s was all we had. We had the illusion we could buy something which was clearly just an illusion, because at the auction properties went too high, but when we saw that opportunity we had to think creative. And that’s again when people say you need money to make money. No, you need knowledge to make money. So in this case what did we do? We actually, what Michelle just said, we thought a little bit about it. We brainstormed seller, what can we do and then we had just heard about this concept of an option, and particularly the concept of a non-exclusive option where really the seller is not locked in. They can sell to anyone at anytime. But if we come to the seller with the money, with the $70,000 before they find somebody else, they have to sell to us at agreed terms. So there’s value in that option because you might say, “Well if it’s non-exclusive they can’t sell to anyone, why even have a non-exclusive option.” Because it still locks in the price, and it still locks in a certain time period, and so we actually had to negotiate with them down from 100 to $70,000. So we locked in the $70,000, we locked in the non-exclusive option which means she couldn’t have sold it to anyone, but she hasn’t been marketing it. She wasn’t putting a realtor on it; she wasn’t doing anything about it. So therefore we pretty much figured that we had a good chance of finding a buyer for that property before she ever would do anything and start selling that property on her own. And that’s exactly what happened. So we went for the non-exclusive option, because with an exclusive one, we probably would have had to pay the full $3500 and option consideration, we would have to spend our money, and with the non-exclusive we were able to do it with just $100 as Michelle said, or it might as well just been $50. I don’t remember. So we then went the moment we had it under contract—we had the option for it and started marketing it. And we marketed it in the news paper in San Francisco. Five cash offers—actually five offers, two of them cash offers. Jack: Even above asking price and we ended up making net after everything $28,000 on that deal. And that was one of our first deals which if you look at it we spent zero money out of our own pocket. Actually untrue, we spent $100 for the non-exclusive option. Jack: Right so therefore, so that’s what an option is. It gives you a right to buy the property, but not the obligation. An exclusive option gives you the exclusive right and the non-exclusive option gives the non-exclusive right meaning the seller can still sell to whoever they want on an ongoing basis. So now how do we use this in our land business? Michelle: Or in the houses as well. Jack: Or in the houses for that matter. Well, here’s how we use this. We like using this in multiple fashions particularly in the land business and the houses business it works too. And that’s the thing. In earlier podcasts, we have showed you already how we make really, really low offers. We offer somewhere between five and twenty five cents on a dollar on pieces of land. However we do that because when you gave a sale agreement as I said earlier which is the actual contract to purchase the thing, the asset, the piece of land or the house, you’re actually ultimately putting your money on the line. You actually have to spend that money to buy the property if you buy it first and then sell it. If you do a double escrow and find the buyer before and so on then it’s a different thing. But if you only want to buy something for—if 20% of market value is $7,000 and you just say okay I’ll buy it for $7,000, then after closing– at closing you have to pay $7,000 plus closing cost. So you are in it perhaps for $8,000. Now you can, and that might be enough for the seller to accept it, but it might be too low for the seller to accept it. So what we sometimes do is we go in and we do what is called a double offer, or what we call a double offer which really is we offer them both a sale agreement and an option. But because with the option we are not locked in, we don’t have the obligation to buy it, we can go much higher in value. We can actually go and take some risks. We can actually go and say if the cash price that we are willing to offer is only $7,000 on a $35,000 property, well the option price might be $16,000 for that deal or $17,000. It might be close to 40%, 50% of market value. And then we give the seller literally two offers. One we say, “We can either buy it for $7,000 or we can option it for $16,000,” and we let the seller choose. In either way it works for us because with $7,000, we’re comfortable paying for it, and with the $16,000 we are comfortable marketing it looking for somebody who might just want to pay us, I don’t know $23,000 and we just make a quick $6,000 on it without using any of our own money. Michelle: And with this, basically what this strategy that Joe just described, from the psychological point of view of the seller, you all of a sudden don’t find yourself in a situation where they are looking at your offer and they are either having the option between accepting or rejecting the offer. Now they have the option between your offer, whether to buy the property outright, or your offer for an option. So rejection is usually not the third. I mean it is an option, but now from their point of view and their mind, in their point of view, from their mind, they are really thinking about just two. Jack: Right. They are basically, you have them now making a choice versus making a decision of whether yes—it’s not a yes or no decision anymore, it’s an either A or B decision which either one works for you. So that’s a good, great, great side benefit of that. You increase your acceptance rate with that. And you never know what they are actually going to do. We have one of our students who bought a property worth $70,000 piece of land and he made exactly that offer. He made a $17,000 cash offer as well as a $32,000 option offer and the seller accepted the $17,000 cash. So you just never know. You would think they would take the $32,000, but if they really want to get rid of that property, they take the lower offer in many cases because they just don’t want to take the chance of it not happening through the option. Because again they understand that the option is just that, an option, not a clear promise. That’s a beautiful thing. So now when we see in our student side, what they do our students and what we do too, is we have students that use now, that because—let me say that first, because our land business we are dealing with, particularly in the land area, we are dealing with sellers that really absolutely just do not care about their properties anymore. They don’t want them anymore. They just don’t want to put anymore time in to it. They don’t want to have to do anything to it. They really are sick and tired of being sick and tired of having these properties. They will sign anything. They even sign exclusive options for over a year for just like one dollar or ten dollar. Jack: Quite a few of our students do that now. They are basically, Renee, Dave, Tom, Henry, you name it. There’s many, many more that do exactly this now where they basically go and offer one year options, exclusive options and offer an option consideration of ten dollars, sometimes even one dollar. It depends on your state laws. Some states you have to offer at least ten dollars. Because these sellers just don’t care, they just want to take any chance to get rid of the burden of property ownership, they even sign those which now gives our students a year to flip these properties, find the buyer, market it and so on. And these are exclusive options. If that seller comes up or somebody else comes up to that seller, and tries to sell– and they get enter a contract, they are violating the law. They are violating their contractual agreement they’ve already entered. So it’s really-really cool. You can use this for your deals, you can use almost on all your options, you can use this double agreement, you can use the sale agreements, but options is a really cool way particularly on higher priced properties that you actually cannot afford to pay for them in the first place. Jack: Right, that’s good, great. Michelle: Sign your new and an actual purchases and sale agreement with your seller, and then either assign that contract over to your buyer, or sign a separate one and do double closing. Jack: Or you can also take if you have a buyer, you can actually just assign the option too. So you can assign. It’s a document that can be assigned as long as you put up there under optionee which is you the person that takes the option, your name, or your company name and then you say, and/or assignee. If you put that in, you can assign it to anyone and even to your buyer and then have the buyer go it. But yes, you do not– great point Michelle because you do not take the option and bring it to the Title Company. You bring—or Title Escrow Company. You actually have to first– once you execute the deal, you want to first of all convert the option into a sale agreement by simply going to your seller and saying like, “Hey I want to execute my option, and here is the contract.” And then you sign a sale agreement and that’s what you take to title, and that’s the basis for closing on a property. All right, anything else Michelle. Michelle: I think that’s what I wanted to share. It’s like it was one of our very first more creative deals that we did, and it was right at the beginning and we were like ecstatic, excited that it worked. We had only heard about it in business school from the financial markets point of view, stock, and derivatives and very fancy. And this was like a real world option and we were just excited to use it. And so we hope you guys have a lot of success using the strategy of using options as well. Michelle: And on iTunes they can rate us. Jack: On iTunes as well as on Facebook. If you go to facebook.com/forevercashlife, and leave us some feedback there too. But yes, we’d love if you rate us on iTunes and not only that, if you also leave a written feedback review for our podcast. Michelle: Just let us know how we are doing. Jack: Let us know how we are doing. Michelle: Do you like what you are hearing? Jack: Right. If you like me interrupting Michelle, no I try not to do that today. Have you noticed? I was called out on it that I’m doing that too often. So I was really conscious about it today, and tried not to interrupt you too often. Jack: All right, so with that we say goodbye and we’ll talk to you soon at our next podcast. Thanks bye, bye. Outro: Thanks for listening to the Forever Cash Freedom podcast. Subscribe now for future content packed episodes on how to push the ejector seat on your financial hamster wheel, and discover our radical way to freedom and wealth through cutting edge real estate investing strategies. To learn more about living the Forever Cash lifestyle, investing smartly, and becoming financially free, visit www.forevercashfreedom.com to claim your free Forever Cash starter kit today.